Just few days left for the grand Finale, CeeC is already caught in a web and from the look of things, she might obviously lose the crown. 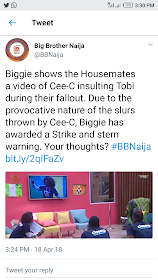 Just few hours ago, Biggie showed the Housemates a video of Cee-C insulting Tobi during their fallout. Due to the provocative nature of the slurs thrown by Cee-C, Biggie has decided to award her a Strike and stern warning. What do you think? Is it enough punishment for a show ending in less than four days?